New Delhi: The Narendra Modi government’s Saubhagya and Ujjwala schemes are beginning to show impact, a survey has found. According to the survey by the Council on Energy, Environment and Water (CEEW), an independent think tank, 32 million households from the six states with the least access to energy — Bihar, Jharkhand, Uttar Pradesh, Madhya Pradesh, Odisha and West Bengal — have moved up from the bottom of the energy ladder. The CEEW released its second ACCESS (Access to Clean Cooking Energy and Electricity Survey of States) after three years Wednesday. The 2015 survey had covered more than 9,000 households in 756 villages and 54 districts, and CEEW revisited them in mid-2018 to evaluate the changes in their energy access situation. The survey found that of these energy-deprived states, the proportion of rural households connected to the electrical grids has gone up to 84 per cent in mid-2018 from 64 per cent in 2015. The 2015 ACCESS had found that the Rajiv Gandhi Grameen Vidyutikaran Yojana (RGGVY), now known as Deen Dayal Upadhyaya Gram Jyoti Yojana, which has been around for more than a decade, had had a positive impact on three of the six states. West Bengal was 99.99 per cent electrified, while the figure for Odisha was 92 per cent. And although Bihar had an electrification rate of 95.5 per cent, 79 per cent of these rural households were classified as ‘Tier 0’ — they received less than four hours of consistent electricity. The central government then introduced the Saubhagya scheme in September 2017, which aimed to provide free electricity to all rural households. According to the 2018 ACCESS, the situation has improved significantly. All six states have shown a considerable reduction in the proportion of ‘Tier 0’ households. In Bihar, the ‘Tier 0’ number decreased to 38 per cent from 79 per cent, while the number of households in Tier 1 and 2 were 18 per cent and 44 per cent respectively. The other five states have shown proportional increases, with West Bengal leading the way. Access to electricity has improved in the six most deprived states through various tiers in the past three years. According to the 2018 ACCESS, the number of LPG connections as well as the use of LPG as the primary fuel has more than doubled since 2015. The number of rural households which only use LPG for cooking has increased significantly — to 19 per cent from 5 per cent in 2015. This means these households have moved from traditional fuels like biogas, which lead to indoor air pollution. Of all the rural households that received LPG connections between 2015 and 2018, more than 50 per cent were beneficiaries of the Pradhan Mantri Ujjwala Yojana. Access to LPG has improved in the six most deprived states through various tiers in the past three years. The total number of rural households using LPG has gone up to 58 per cent in 2018 from 22 per cent in 2015. West Bengal once again leads the way with 68 per cent, up from 22 per cent. In Odisha, the number has jumped to 50 per cent from 9 per cent, and in Jharkhand, to 34 per cent from 6 per cent. Adoption of LPG has increased by more than two-fold in the six states in the past three years. The Saubhagya scheme aims to achieve 100 per cent electrification by March 2019. However, in these six energy access-deprived states, only 91 per cent of rural households have been connected so far. Many villages battle day-long blackouts and voltage fluctuations, so reliability is a deterrent. 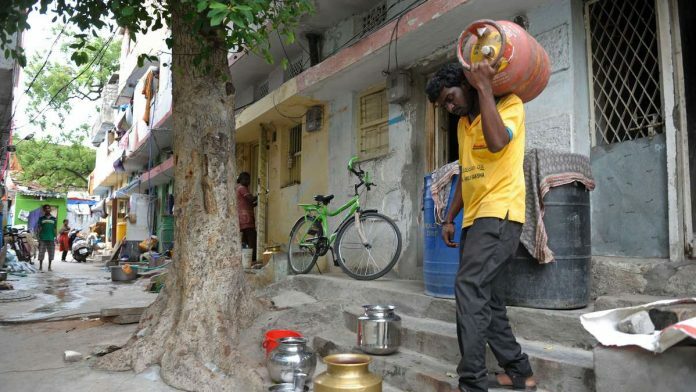 When it comes to door-to-door provision of LPG cylinders under the Ujjwala scheme, providing service to remote villages still remains a problem, said Ashutosh Jindal, joint secretary in the ministry of petroleum and natural gas, at the launch of the ACCESS.